A nano-satellite platform based on commercial standards and smart-phone technologies. Space is currently restricted to governments and large corporations due to the large cost associated to spacecraft design and launch. Although various initiatives have appeared with the vision of democratizing the access to space such as public telescopes (ILU Telescope, Arkyd) or open-source/crowd-funded satellites (Ardusat, Kicksat), the barrier is still too high for the general public. The Android Beyond the Stratosphere (ABS) project, which was recipient of a Google Faculty Research Award in the 2013 call, is aimed at providing a public access to space through the creation of an Open Space Station: a satellite constellation conformed by Android-based nano-satellites which allows the execution of community-developed Android applications in space. 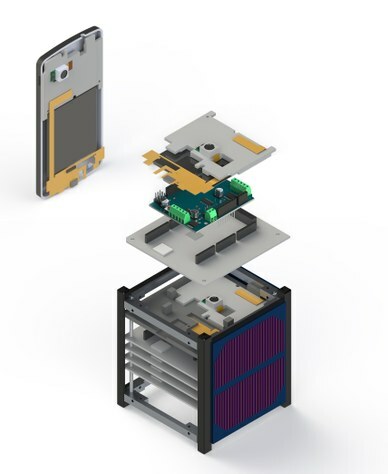 The OSS basic building block, the ABS Unit, encompasses both the essential hardware and software components required to build a highly modular payload-oriented nano-satellite. A Real-Time Operating System (RTOS) is required given the fact that space applications are safety-critical and require highly reliable and deterministic software. Consequently, one of the major axis of the ABS project is the development of an Android Real-Time Operative System (ARTOS) based on a Linux kernel (e.g. Hammerhead or a mainline kernel) and a RT patch (e.g. Xenomai, PREEMPT_RT). Secondly, this project also proposes the development of a modular, payload-oriented, scalable architecture, which shall be capable to control the spacecraft resources, instruments and subsystems. This architecture is proposed to be deployed on top of the ARTOS and to be tightly integrated with the existing Android framework (Java virtual machine, Android core, libraries and so on). Finally, the software framework of the ABS also encompasses an Satellite Development Kit ("PayloadSDK") which allows Android developers to seamlessly access Arduino functionality and devices from the app level. Android Real-Time Kernel repository. (Managed by Marc Marí). Hardware platform repository. Contains the source files for all the boards, mechanical parts and COTS references that will allow to replicate all the physical components of the ABS nano-satellite unit (including the custom Arduino payload control board, test boards, photo-voltaic panels, custom antenna, and the like). The platform released in the repositories is currently under development. Every single line of code, schematic, PCB layout and report has been the result of a collaborative effort between many graduate and undergraduate students at UPC's NanoSat Lab over the last 3 years. Right now, the preliminary outcomes of this project are open to the academic, scientific and industrial community to promote engagement and encourage collaborations. If you find this project appealing and are willing to contribute, please do not hesitate to contact us. We would love to share our experience with you and are thrilled with the idea of community of space-makers.